Merck is going to discuss its latest soluble OLED material performance at SID DisplayWeek 2017 next month. Merck will detail the printed device efficiencies, voltages, and colors. According to Merck, the efficiencies of its soluble OLED emitters are now comparable to state-of-the-art vapor-processed devices. Merck will also suggest a move from an evaporated blue common layer device architecture to a printed blue. Merck is stepping up its efforts in the OLED market as it aims to become one of the leading suppliers of OLED materials by 2018. In September 2016 the company inaugurated its €30 Million OLED materials production plant in Darmstadt, Germany, which provides a fivefold increase in the company's OLED materials production capacity. A few months ago Merck announced an OLED patents cross-licensing agreement with Idemitsu Kosan. Merck has recently inaugurated an OLED application center in Korea, where it will introduce advanced processes such as inkjet printing. The same site also hosts Merck's Chemical Application Centre established in 2011. Merck also operates a technology development center in Taiwan - which also focuses on OLEDs. The company is developing soluble OLED materials in collaboration with Seiko Epson. It will be very interesting to hear Merck's current material performance and how it compares to the latest evaporable OLEDs. 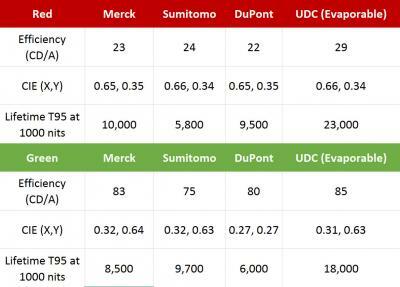 Merck already said that the performance gap has pretty much closed in 2015, but that refuted by the OLED Association in 2016 which released the comparison table you see below. Hey Ron - what does this development mean for universal display's emitter tech? Good question Dan, I don't have a good answer though, time will tell.